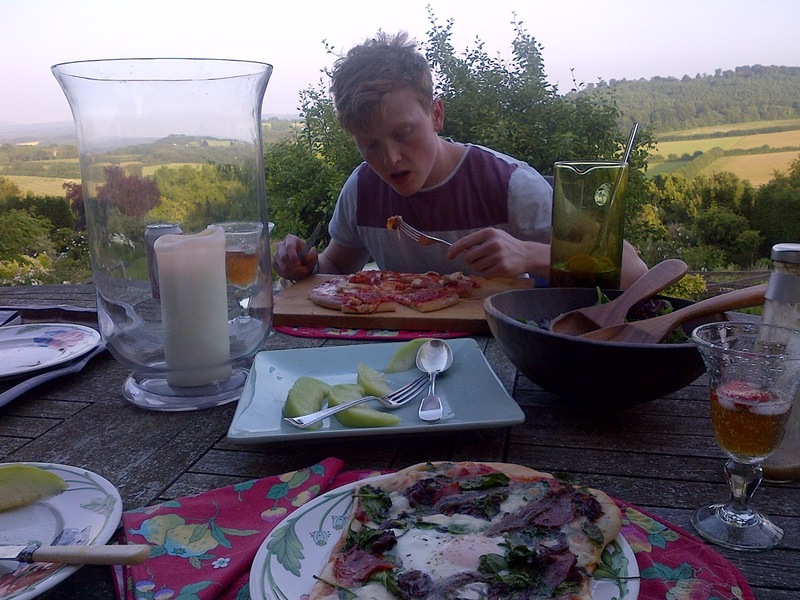 Nothing tastes as good as homemade pizza. One gloriously hot weekend I travelled home to find a house sans parents…and in their place two hungry boys, aka my brothers. There was nothing for it but to get some pizza dough rising and raid the fridge for potential toppings (regardless of being related we all have very different views on the perfect pizza flavour). Pizza dough is so easy as it only needs one rise. The critical part is getting the oven to it absolute hottest when cooking. I always find Jamie Oliver’s dough recipe brilliant. You can get about six large pizzas out of it and left overs freeze perfectly for when you next need a quick pizza supper. Mix 2 x 7g Dried Yeast Sachets into 640ml Lukewarm Water and 4 tbsp Extra Virgin Olive Oil. Leave for several minutes until it is frothy and you can hear it fizzing. Sift 1kg White Bread Flour. 1 tsp Caster Sugar 1 tsp Sea Salt into the bowl of a mixer with the dough hook attached. Begin mixing and gradually add the yeasty liquid. Mix until a smooth dough is formed and the dough springs back when poked. Put in a oiled bowl, cover with clingfilm and leave to rise in a warm place for about an hour. Meanwhile, to make a tomato sauce, all I do is heat 2tbsp Extra Virgin Olive Oil in a saucepan and gently cook 2 Crushed Garlic Cloves until soft. Then add 2 Cans of Chopped Tomatoes (Cirio have the best flavour). Add as much basil leaves as you can afford (save some for the pizza). Heat for a couple of minutes to let all the flavours mingle and season with a little sugar, salt and pepper. Whizz in a food processor until you have a lovely smooth passata. Once the dough is risen all you need to do is punch it back, divide into 6 balls and let everyone shape their dough. The more irregular shaped, the better tasting in my opinion! Place the base on a baking tray and spread a thin layer on tomato onto the dough. Then bespoke-up your pizza with anything you fancy. AJ went for a classic americano with added anchovies and olives. Toby likes his dough thick and plain with mozzarella and pepperoni. I did a kinda Fiorentina with mozzarella, spinach, a cracked egg (do this in the last 2-3 minutes of cooking for a runny yolk) and anchovies. All were sprinkled with Parmesan, basil and lots of olive oil. 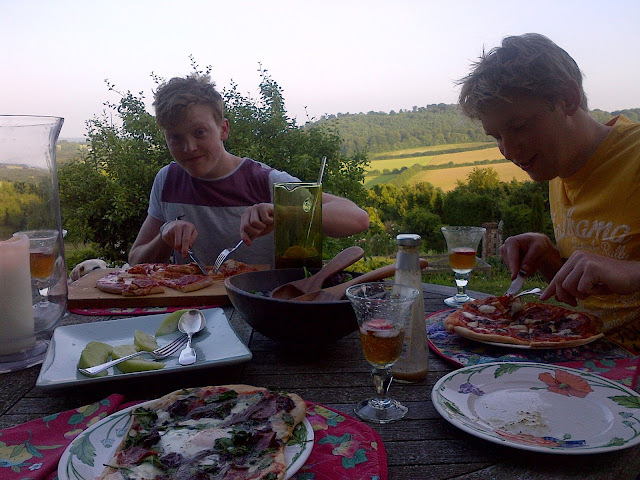 We also completed our feast with Prosciutto and Melon and Pimms. 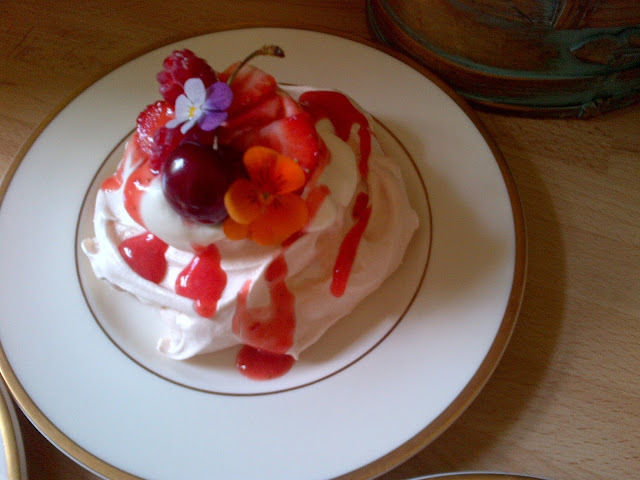 On the off chance that they were still hungry, later on, I found some of my individual pavlovas left over from a party and topped them with a healthy mound of cream, cherries, strawberries, a raspberry sauce and violas. They were monstrous but wolfed ridiculously fast! Preheat your oven to 180C. For the meringue base whisk 2 egg whites until soft peaks form. Gradually whisk in 150g Caster Sugar until the mix is glossy and firm. Lastly fold in 2 tsp Cornflour and 1 tsp White Wine Vinegar. Line a baking sheet with parchment and spoon on 6 large mounds. Place in the oven and immediately turn it down to 120 degrees. Cook for 1 hour, then turn off the oven and leave in to cool with the door slightly ajar. To finish, whizz a punnet of raspberries with a little sugar to taste in a processor. Loosely whip some double cream, spoon onto the pavlovas and top with sliced strawberries, cherries, a drizzle of the sauce and any edible flowers. I stole some violas from my mum’s pots.